The study of rock dynamics is important because many rock mechanics and rock engineering problems involve dynamic loading ranging from earthquakes to vibrations and explosions. The subject deals with the distribution and propagation of loads, dynamic responses, and processes of rocks and rate-dependent properties, coupled with the physical environment. Rock dynamics has a wide range of applications in civil, mining, geological and environmental engineering. However, due to the additional "4th" dimension of time, rock dynamics remains, in the discipline of rock mechanics, a relatively more challenging topic to understand and to apply, where documented research and knowledge are limited. 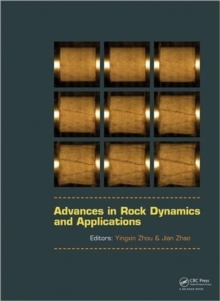 Advances in Rock Dynamics and Applications provides a summary of the current knowledge of rock dynamics with 18 chapters contributed by individual authors from both academia and engineering fields. The topics of this book are wide-ranging and representative, covering fundamental theories of fracture dynamics and wave propagation, rock dynamic properties and testing methods, numerical modelling of rock dynamic failure, engineering applications in earthquakes, explosion loading and tunnel response, as well as dynamic rock support.